1. 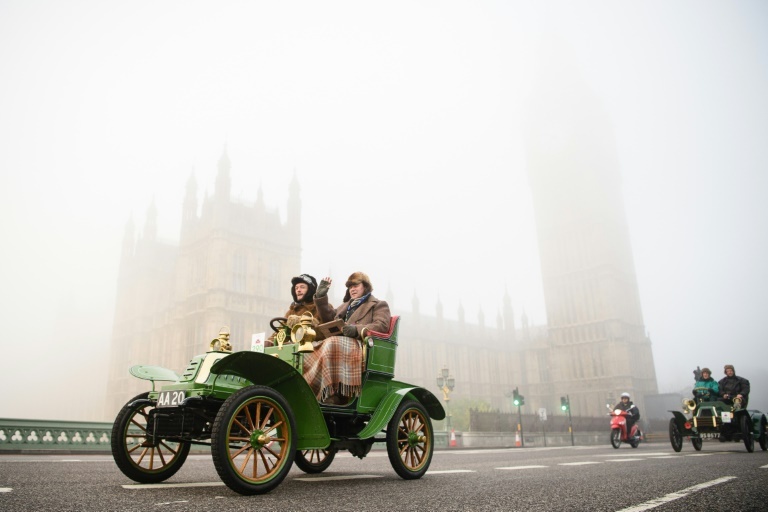 Vintage cars pass the Houses of Parliament in Westminster shortly after beginning the 119th “Veteran Car Run” from Hyde Park in London to Brighton. 2. 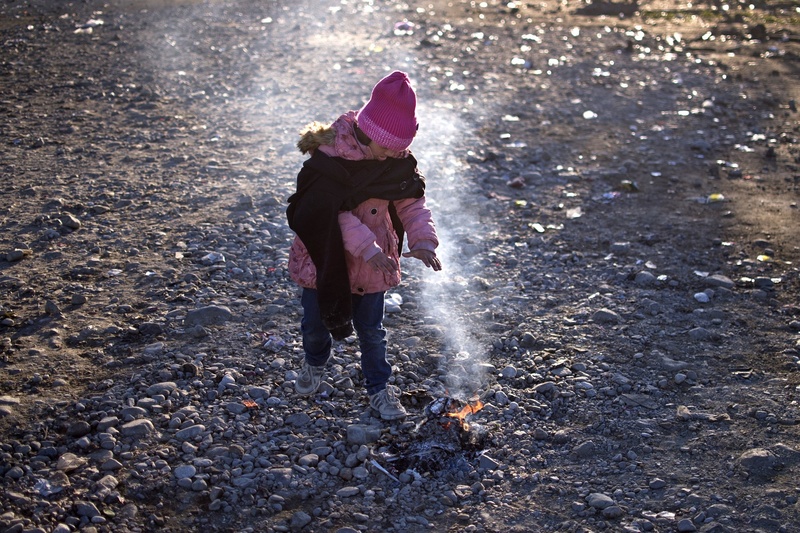 A young girl tries to keep warm by a small fire, while waiting to enter a registration camp after crossing the Greece-Macedonia border. 3. A model displays a creation by Japanese designer Yuki Torii during Torii’s 2016 spring/summer collection at Tokyo Fashion Week. 4. 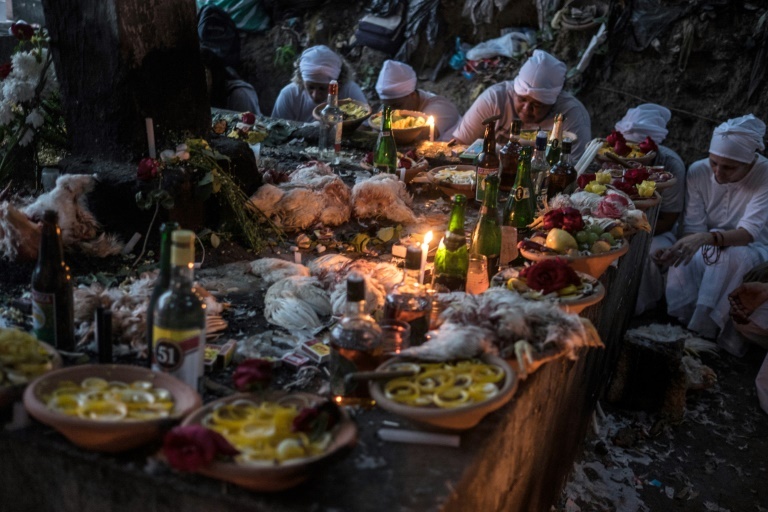 Faithful participate in a candomble ritual of the African-Brazilian religion at Botafogo cemetery in Rio de Janeiro, Brazil. 5. Paris Saint-Germain’s forward Zlatan Ibrahimovic (L) vies with Real Madrid’s goalkeeper Keylor Navas (R) and defender Sergio Ramos during the UEFA Champions League group stage football match at the Santiago Bernabeu stadium in Madrid. Real Madrid won the match 1-0. 6. 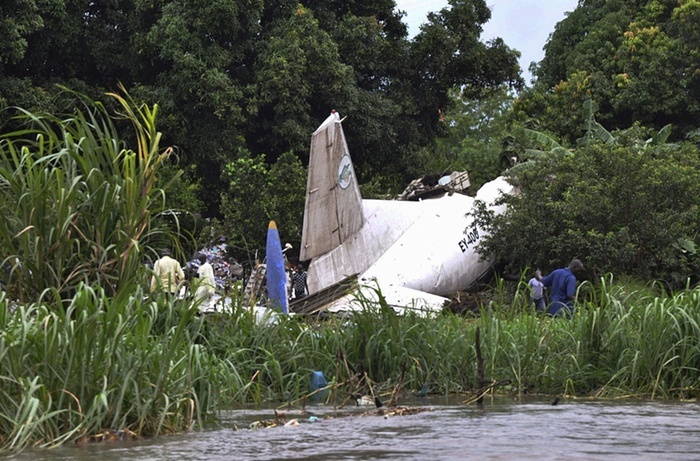 Officials inspect the wreckage of a cargo plane that crashed after take-off near Juba airport in South Sudan. More than 35 people were killed during the crash, including some people on the ground. 7. 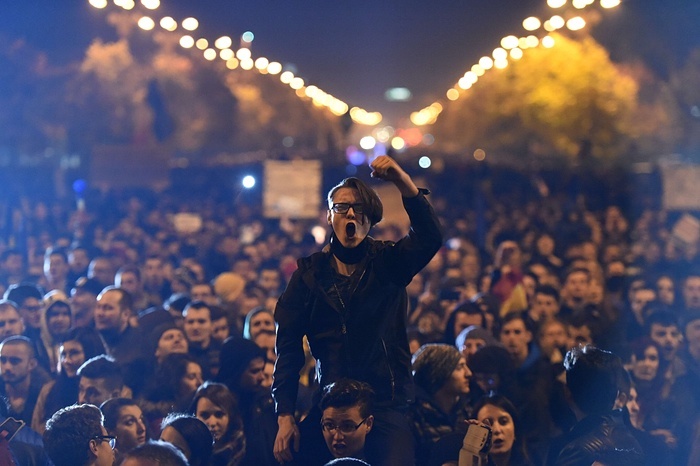 Demonstrators protest against the political class and Romanian authorities during a second day of action in Bucharest, Romania. 8. 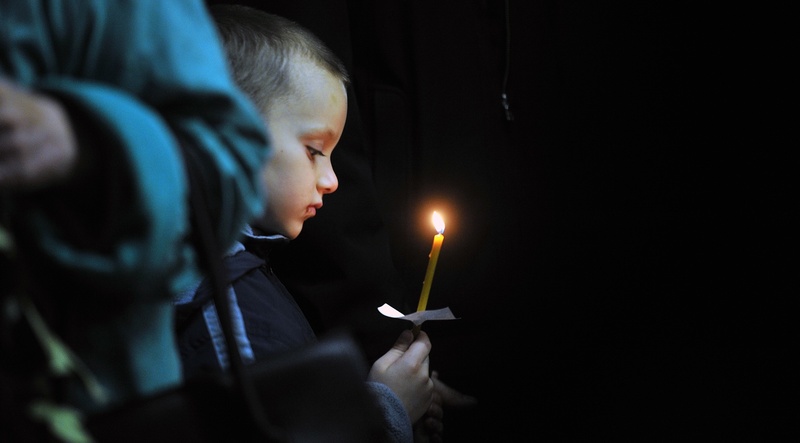 A boy attends a funeral service for Nina Lushchenko, 60, a victim of the Russian MetroJet Airbus A321 crash in Egypt which killed more than 200 people. 9. 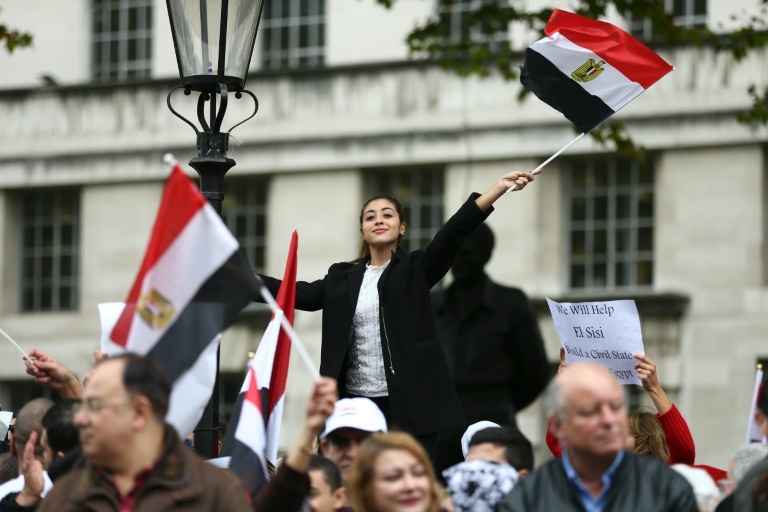 Supporters welcome Egyptian President Abdel Fattah al-Sisi by waving Egyptian flags during a rally outside Downing Street in central London. The Egyptian president is set to hold talks with British premier David Cameroon on Security and the sinai plane crash. 10. 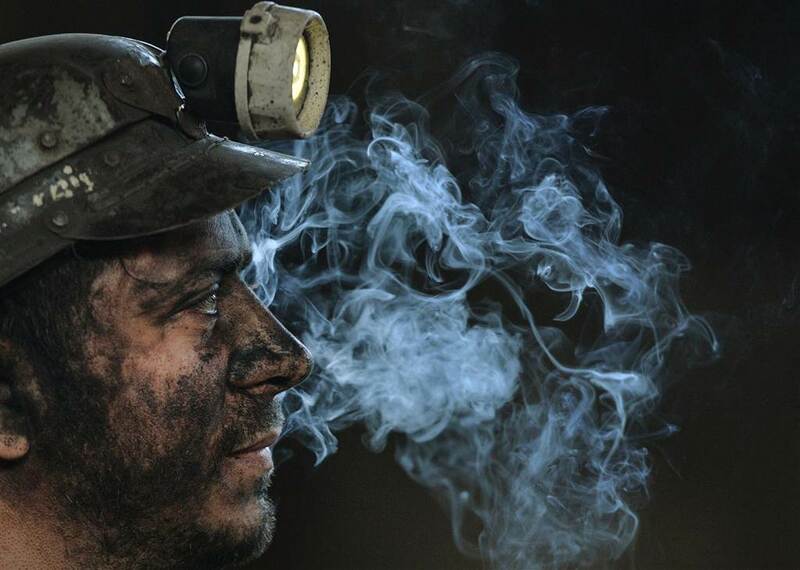 A miner is seen at the end of his last shift at the coal mine in the Romanian city of Petrila. The mine is the oldest coal mine in Romania and the deepest one in Europe. It opened in 1859 under the Austro-Hungarian Empire but closed this week as part of Bucharest’s promises to liquidate unprofitable mines. 11. 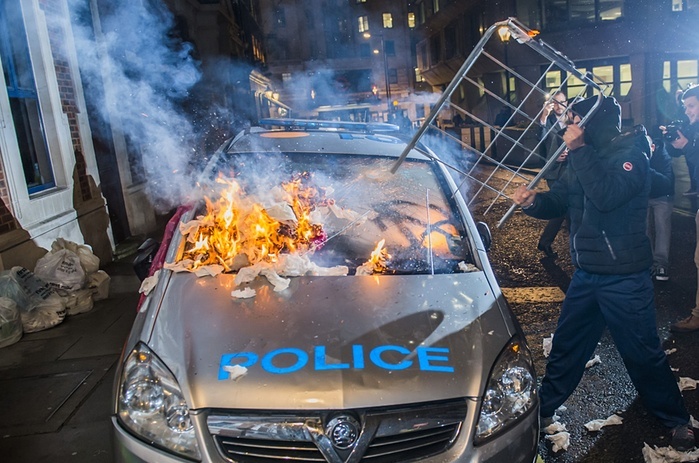 A police car is set on fire during the ‘Million Mask March’ in Central London by the activist group Anonymous. 12. 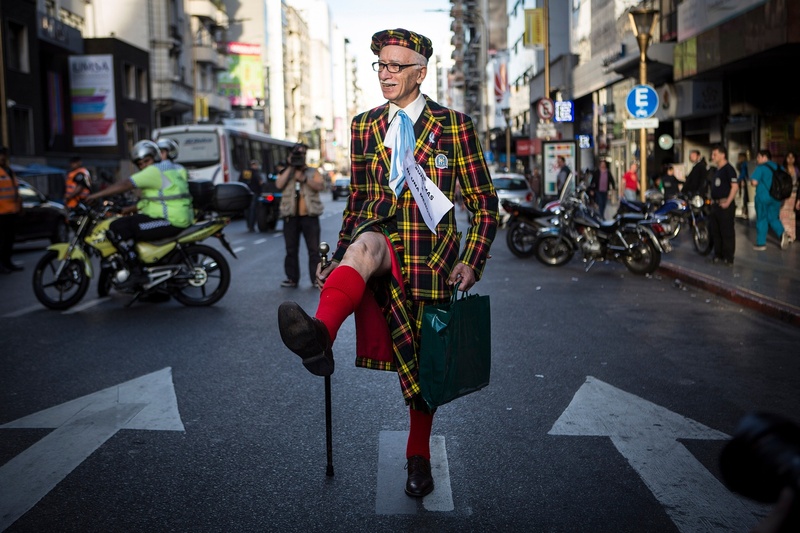 A demonstrator wearing a skirt participates in a march against gender violence in Buenos Aires, Argentina. The protest was organised by social networks with the slogan “Wear the skirt if you are a male”. 13. Smoke billows from a building following reported shelling by government forces in the rebel-controlled area of Douma, on the outskirts of Damascus, Syria. At least 40 people were killed and about 100 wounded after missiles were fired into one of Douma’s markets. 14. Volunteers and local residents help refugees and migrants disembark from a small vessel after their arrival in Skala Sykaminias on the northeastern Greek island of Lesbos on the 30th of October. Greek authorities say a number of people have died near other islands after two boats carrying migrants and refugees from Turkey to Greece sank overnight, in the latest deadly incident in the Eastern Aegean Sea. 15. In Istanbul, a bus is driven past supporters of Turkey’s Justice and Development party as they celebrate the first results in the country’s general election. 16. The Russian president, Vladimir Putin, poses for a photograph with students of the Vympel military patriotic centre, after a flower-laying ceremony in Red Square in Moscow, Russia. Posted in Art, World and tagged featured, la chat, photography, the update, the week in pictures. Bookmark the permalink.